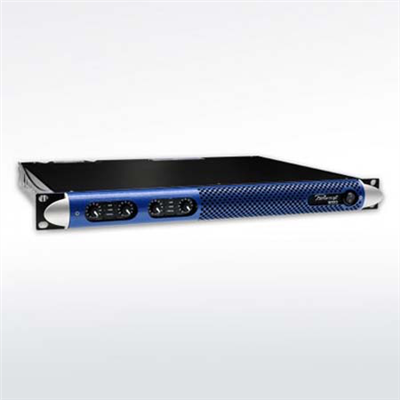 With 5,000 W across four channels in a single rack space unit at a mere 7.4 kg / 16.3 lb weight, the M50Q is equally versatile in touring and permanently installed racks.Legendary sound quality deriving from Powersoft's patented technologies, and outstandingly high efficiency are making the M50Q the leader in its class. Optimized for mid-sized sound systems and 4? loads, it is a fantastic value, practically as well as commercially. In use worldwide by leading touring and event sound companies, Powersoft amplifiers are preferred among the top ranking system designers, sound engineers, and contractors for providing reliable premier-grade power and headroom in the smallest possible package size.Maximum efficiency warrants minimum current draw, heat dissipation and power consumption, resulting in "green" products, saving the user a substantial amount of money over time. The M50Q HDSP+ETH version provides on-board DSP and Ethernet interfaces.The high-performance DSP is hidden inside and safe against accidental or intentional tampering; monitoring and amplifier settings can be done via Armonía Pro Audio Suite™ (Interface available for MediaMatrix, Crestron, AMX, Q-SYS control and monitoring systems).